A three-edge-supported slab is the one supported along three edges, such as slab s5 illustrated in §4.1. Static analysis is performed similar to two-way slabs (i.e. considering each individual slab), by means of tables e.g. by Hahn. Moments are practically distributed according the approximate method of § 4.6.3.3. The tables support global uniform loads, continuous linear uniform loads on free edges and continuous linear moments on free edges. 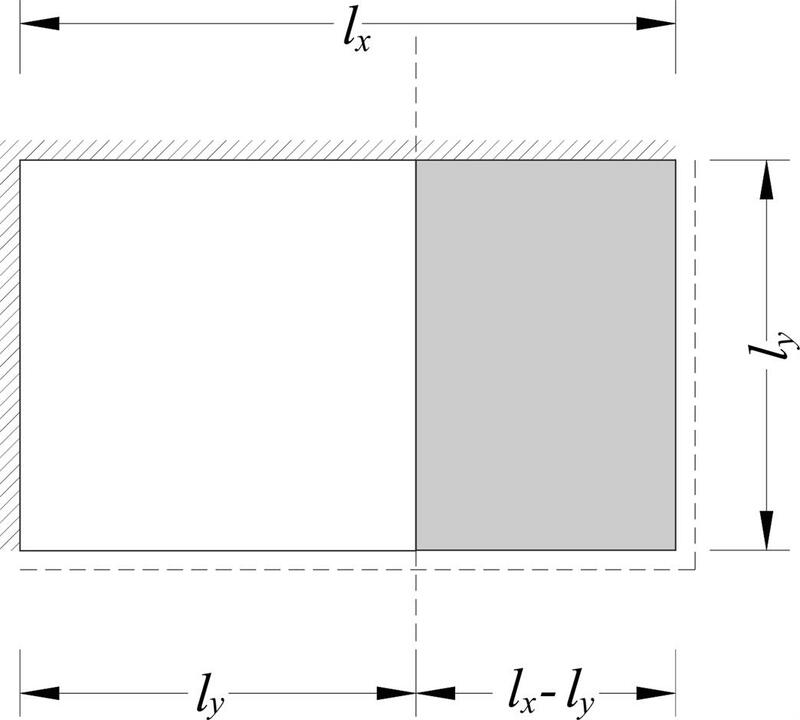 A slab of shape Γ is analyzed considering one three-edge-supported slab and one two-way slab, as shown in figure below. This method is proposed by Hahn and it requires particular attention reinforcing the slab. Indicatively, it is emphasized that continuous reinforcement should be placed along the lower fibers at the theoretical boundary of the two-way slab and the three-edge-supported slab. A two-edge-supported slab is the one supported on two adjacent edges, such as slab s6 shown in §4.1. Static analysis is performed similar to two-way slabs, by means of tables e.g. by Stiglat. Special attention should be paid to the reinforcement distribution, which has to be compatible with that of the corresponding moments distribution. Near edges, these slabs behave practically as cantilevers (of course depending on the aspect ratio ly/lx), such as the slab section with length lx-ly , illustrated in the figure.